A Tom Doherty Associates Book, New York, 2014. 174 pages. I didn’t expect to like this book as much as I did. I thought I’d just dip into it, and the first story had me laughing out loud. Mind you, the book got a little long for my taste, but I don’t think kids will have the same problem. And there’s a simple solution: The stories are short, so just read one or two at a time. Even when I thought I was getting tired of it, I found myself picking it up again, and smiling by the time I put it down. Think of this book as short episodes of The Twilight Zone for kids. It reminded me of Half-Minute Horrors, only with somewhat less variety, since all the stories were written by the same author. However, don’t get me wrong — there is plenty of variety. Some stories are scary, some have bad kids come to a rotten end, some are hugely funny, most have twist endings, and almost all are very clever. This book, like Half-Minute Horrors, would be easy to booktalk. Simply read your favorite story — they are all very short — and you will immediately hook the readers who like this sort of thing. I can’t really describe details of the stories without giving away the twists. But David Lubar covers things like what parents will do to get out of throwing a birthday party, technology gone crazy, monsters coming to life, the dangers of being all wrapped up in your phone, alien contact, and how if you’re not nice, it may come back to bite you. 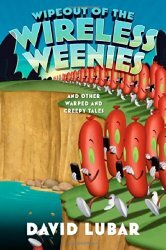 Basically, “Warped and Creepy Tales” sums up the book nicely. Alfred A. Knopf, New York, 2014. 368 pages. Maeve wrote the stories over several decades, reflecting the city and people of the moment – always with the idea of one day making them into a collection with Chestnut Street as its center. 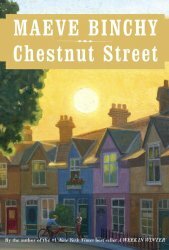 I am very pleased with the way her editors have now gathered them together as she intended, to make this delightful new Maeve Binchy book, Chestnut Street. This book reminds me more of Maeve Binchy’s earlier books than the later ones – it is composed of many short stories, all including someone who lives on Chestnut Street. Her later novels are similar, but have longer stories, with more of the threads intertwined between stories. A few of the characters do appear in passing in additional stories, besides the ones where they are featured, though there’s definitely not the unity of theme found in her later books. That said, these are some truly delightful stories. Maeve Binchy knows human nature. So many of these stories, short as they are, leave you with a smile or an insight or just a good feeling that someone made a great choice. I liked that they are short, since that way there are more of them, though it did make it take longer to read – because after a few stories, I found myself wanting to give an appreciative pause rather than barrel on to the end, as I will with a good novel. 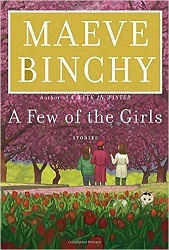 A wonderful chance to treat yourself to Maeve Binchy’s characters one more time. Marshall Cavendish, 2010. 127 pages. I loved Vivian Vande Velde’s The Rumpelstiltskin Problem, so I made sure to snap up Cloaked in Red when I heard about it. In both books, she takes a fairy tale you thought you knew, and casts it in a very different light. Okay, several different lights. She looks at the story from many different perspectives. Or how about the heroine’s unusual name? “I don’t like to criticize anyone’s family, but I’m guessing these people are not what you’d call close. Little Red doesn’t realize a wolf has substituted himself for her grandmother. I only met my grandmother three times in my entire life, but I like to think I would have noticed if someone claiming to be my grandmother had fur, fangs, and a tail. “But Little Red, instead of becoming suspicious, becomes rude. “However you look at it, ‘Little Red Riding Hood’ is a strange and disturbing story that should probably not be shared with children. The eight stories that follow are amazingly varied, even though you can see how they relate to the fairy tale. These ones seemed darker to me than the ones in The Rumpelstiltskin Problem, but then “Little Red Riding Hood” is a quite dark and violent tale. We’ve got one from the perspective of pretty much every one in the story. I like the one where Jakob and Wilhelm, the dimwitted Grimm brothers, sons of a woodcutter, misunderstand when Grandma’s talking about making a wolf draft-stopper for her granddaughter. My favorite is probably the one about the nice wolf who is trying to be helpful after an annoying little girl steps on his tail, screams, and drops her basket. “The wolf inhaled deeply the tantalizing smells of meat and baked goods, and was strongly tempted to gobble everything up. But his mother had raised him better than that. “Apparently the little girl could not understand wolf speech any more than the wolf could understand human speech, since she didn’t come back. Reading this book makes me want to try my hand at rewriting fairy tales. Above all, all the variations are clever and inventive and a nice exercise in how point of view changes a story. Houghton Mifflin Books for Children, 2011. 221 pages. One of the highlights of my year this year was when, on vacation, I was driving my son a couple hours in the State of Washington to visit a college, and I got him to read aloud to me from The Chronicles of Harris Burdick as I drove. He’s 17, and we both thoroughly enjoyed the stories. But let me backtrack. Many years ago, when I was first married (so about 25 years ago, in fact), a friend of my husband and me gave us The Mysteries of Harris Burdick for Christmas. (Thanks, Len!) It maybe wasn’t a traditional gift to give a young couple, but we both loved it. Chris Van Allsburg implied so much between the pictures, the titles, and the captions. Back in 1993, Stephen King wrote a story to go with “The House on Maple Street” (the picture with the caption “It was perfect lift-off.”) For this volume, they asked fourteen distinguished authors (including Chris Van Allsburg) to write stories to go with the pictures. At first, I thought it might be a shame to actually write down a story. But I’ve been thinking about these pictures too long. I don’t feel like these are the only possibilities. In fact, looking at the pictures still gets your mind spinning — but these offerings are still tremendous fun. Some do a better job than others, and some used approaches I wouldn’t have ever taken, but I can honestly say that I enjoyed all the stories. In fact, this would be a fine collection of stories even if it didn’t have such an intriguing history. In fact, I hope the publishers will consider making this a tradition every decade or so, and get 14 more authors to write the stories! These stories are eerie enough, they aren’t for the usual picture book crowd. Teens, like my son, will definitely enjoy them, and so will elementary age kids who can handle and enjoy some creepiness. Like the years when we’d read our new Harry Potter book in England or Bavaria or wherever we were traveling on vacation, this book, in a smaller way, definitely enhanced my vacation. After all those years of reading to my boys, it’s a treat to find a book that my son is willing to read to me. We only finished half the book on vacation, but when I read M. T. Anderson’s story, I insisted that my son read it as well. I can confidently say this book spans many age ranges.